The first televised featherweight fight in UFC history lived up to the billing as Nam Phan and Leonard Garcia went to war for three rounds, but in the end the judges may have put yet another black mark on an otherwise stellar fight. 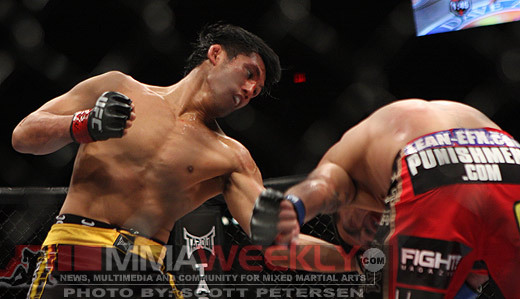 Phan dropped back down to his natural weight of 145lbs since being eliminated on the final episode of the “Ultimate Fighter” season 12, and didn’t disappoint in his official Octagon debut, but somehow the judges scored the fight in a split decision nod for his opponent Leonard Garcia. Showing tremendous discipline against a highly unorthodox opponent, Phan used controlled punches to the body and a mix of straight punches to keep Garcia guessing for all 15 minutes. Garcia came out like a hurricane in each round, but faded as the minutes passed, just losing steam with the haymakers he unloaded trying to put Phan away. In the 2nd round, Phan dropped Garcia with wicked series of lefts and rights, before almost locking on a fight ending rear naked choke. 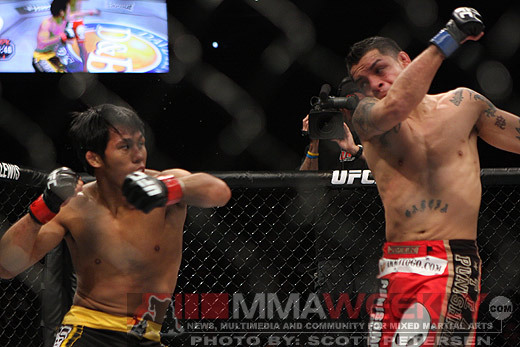 By the end of the fight, Garcia’s midsection was absolutely tattooed from body shots absorbed by Phan’s attack. It seemed like a no brainer for the decision, but much like Tyson Griffin and Evan Dunham can tell Phan after the fight, when the judges get involved anything can and likely will happen. Two judges saw the fight 29-28 for Garcia, while a lone judge scored the fight 30-27 for Phan. A stunned look washed over Phan as he saw his UFC debut come to a screeching hault. He may have won the fight, but even Leonard Garcia agreed with the boisterous crowd in attendance in Las Vegas as they booed loudly at the highly controversial decision. The judges once again proved that MMA has a long way to go before scoring can be legitimized, with several decisions ending in extremely controversial fashion over just the last few major events. Garcia will still celebrate a win, but Phan deservedly should get another shot at the New Mexico based fighter at some point down the road.